Has the rear window leak been permanently fixed, if so when? If they want to move the metal with these cheapened trucks,they’ll have to. To name a few, adjustable seat belts, chrome trim around gauges, adjustable brake pedal, turn signal in mirrors, sunglass holder, lighted vanity mirror. Options not available, panoramic sunroof, adaptive cruise control and switch in bed to operate bed lights. The competition has em, why not GM? Also cheaper grades of plastic in the interior then the K2’s. I am waiting for 15k off, new interior and for GM to put back all the content that was on the K2’s. They should remove the black widget on the front corner of window. What’s the point of it, it reduces visibility and looks cheap. Any word on updated interiors and putting de-contented features back on new trucks? Gotta pay for the autonomous and electric cars that are coming. Thus we get the cheap interior and loose many features that were available and standard on the previous generation truck. Can’t believe how dumb GM thinks it’s customers are! Terrible Feature - Truck Shuts Off On It's Own?!?! This feature was added for the idiots who park their truck in the garage and forget to turn it off due to the push button start. Yah, I got $3500 in GM points, seeing their capped, I use PayPal MC and earn 2% cash back on everything. You can transfer earnings anytime to PayPal account, then to your bank. How is the DFM working for you? That’s why GM always kept their trucks smaller then Ford and Ram on the exterior. How much bigger do these trucks need to get? It’s rediculous! I’m hoping for a complete re-design of the interior, hopefully with better materials! Wait a couple of months, they’ll be 10k to 12k off. 1500 off is peanuts! Finally, maybe something that is class leading! opinion Did Chevy Botch SEMA 2018? 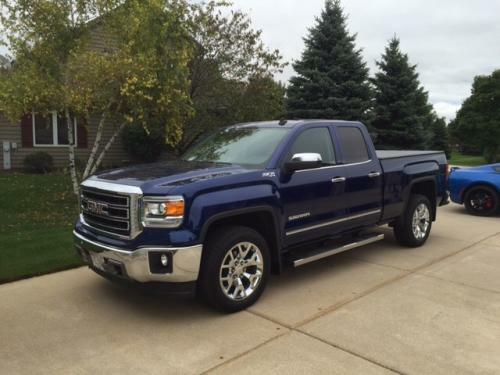 There is a reason GM quit reporting monthly sales, they know they’re going to slide to 3rd place in truck sales. All Mary Barra cares about is profit per vehicle, that’s why we have the outdated, cheap interior in the new trucks. Also why the latest tech Ford and RAM have and is missing on the new trucks. Greed will be the death of GM.